Last week, while chatting with my pal Lee -- personal stylist to Jen-Luc Piquant and an occasional guest blogger here at Cocktail Party Physics -- she complained about a noticeable increase in strange interference effects. For instance, she occasionally comes home to find the radio playing, courtesy of her neighbor's universal remote. And sometimes her cell phone "talks" to her computer speakers. In Lee's words, "What I want to know is, who the hell is using my cell phone to talk to the Mother Ship?" I can commiserate, having gone through an irritating period where I temporarily lost my home WiFi signal every time I turned on the microwave. It's a fairly common problem, actually, and in my case there was an easy fix: changing the point access channels so the two radio frequency (rf) ranges didn't overlap. All this interference probably shouldn't be all that surprising, considering the growing number of wireless and remote devices scattered about the average American household: not just microwave ovens, but other WiFi access points, cordless phones, wireless video cameras, game controllers, Bluetooth devices, sometimes even bad electrical connections or fluorescent lights. No wonder rf interference is particularly problematic in population-dense areas like New York City (and specifically in Lee's densely packed neighborhood in the Bronx). The real miracle is that it doesn't happen more often. And more devices are constantly appearing on the market: just last week, the digital design company IconNicholson announced its new three-panel Magic Mirror, an interactive technology that can be set up outside the dressing rooms of boutiques. Shoppers can see how an outfit will look on them without physically trying it on. If they're unsure about their fashion choices -- and what teenager isn't? -- they can send live video to their friends and receive near-real-time feedback. The company's press release describes it as "Facebook meets the mall." Microwave ovens generally emit signals in the same 2.4 GHz frequency band that most WLANs employ, so occasional crossed signals are almost inevitable. That's also why the signal might sometimes be weak if too many people are using WiFi access points in the same frequency range, in the same general region, causing slower rates for Web browsing and file downloads. Some might argue that the problem of interference pales in comparison with unknown long-term adverse health effects that might be related to prolonged exposure to all these electromagnetic fields. "Cell phones cause cancer!" scream the fear-mongering headlines -- echoes of the power line controversy in the 1980s and 1990s. There's an undeniable element of hysteria in some of this, like the case of a Welsh teacher -- reported in December -- who claimed to become ill whenever he taught in front of a WiFi transmitter. Most news reports failed to mention the follow-up controlled experiment, when the teacher didn't know the WiFi access point was turned off, and still reported feeling ill. In February 2000, the Swedish National Institute for Working Life reported on a survey of 5000 cell phone users in Norway and another 12,000 in Sweden. Fully one-quarter complained they felt "warmth on or behind the ear" when using their phones, and 20% reported recurring fatigue and frequent headaches after long conversations on their cell phone. *Cue gratutious eye-rolling* Oh please. My ears get warm after prolonged lying down on a pillow, thanks to the transfer of body heat, and I have yet to hear reports that pillows might have adverse health effects. I get headaches, too, but I don't blame it on my cell phone. After all, I occasionally got headaches in the pre-cell phone era, and no one ever thought to attribute it to my AM radio. Even a rep for the Swedish National Institute admitted that they didn't specifically measure rf emissions from the cell phones, and many of the symptoms could also be traced to other factors, like plain old garden-variety stress. Jen-Luc Piquant cynically points out that there is no mention of a control group experiment; chances are, exposing an untreated cell culture to the same frequency wouldn't have caused any observable changes either. Her cynicism is shared by Michael Bluck, an engineer at Imperial College, London, who rightly points out that humanity has been bathed in electromagnetic waves since the dawn of time, and that these waves are used by electronic devices precisely because they don't interact significantly with our bodies. He advised concerned readers of The Guardian (which reported on the new product) to forego buying snake-oil products like Clarin's E3p mist. If they're worried, they can "live as far away from the producers of EM waves as possible, and live with the consequences of having no friends and no life." On the flip side, one doesn't like to blithely dismiss such concerns out of hand, especially if one has ever perused the gruesome historical archive photos of early X-ray pioneers. People used to think X-rays were harmless, too, so much so that they got "bone scans" for a lark, and even used X-ray machines in shoe stores for awhile to determine sizing. Many scientists and physicians who worked routinely with X-rays lost their hair, developed cancerous tumors, and had to have various extremities amputated before people finally realized, hey! Maybe zapping human beings with enormous amounts of X-rays isn't such a great idea! In 1904, Thomas Edison's assistant, Clarence Dally, died from prlolonged X-ray exposure. Ever the scientist, he carefully documented the burns, serial amputations and diseased lymph nodes leading up to his death. Once scientists understood the effects, they were able to develop precautionary measures, so we could reap the benefits of X-ray technology while still protecting our health. However, the dangers of X-rays were pretty clearcut and easily observed; ditto with the high-energy gamma rays associated with nuclear bombs or power plants. Both are examples of ionizing radiation, which causes cells to mutate and sometimes die. Radio frequency energy is far, far lower, insufficient to cause mutation of biological cells. That's not to say it doesn't have biological effects: get enough rf energy focused in one place, and it can heat tissue; such an increase in body temperature can certainly cause some damage, particularly to the eyes and testes. But we're talking huge amounts of rf energy, not the incidental signals emitted by cell phones, microwaves, and other wireless devices. And yet... and yet... with so many more rf devices popping up in population-dense regions, and people spending longer amounts of time using such devices, could there be any long-term ill effects from prolonged exposure even to the tiny rf signals being constantly emitted around us? The middle ground is to call for more research, specifically tightly controlled studies, in hopes of settling the matter once and for all. An article on the NIH Website cites several major studies showing no link between cell phones and cancer, but stops short of declaring this to be a definitive answer, because those were short-term studies. There have been more long-term studies in the last six years indicating biological effects in animals triggered when they were bombarded with rf radiation of frequencies used by typical cell phones. A 2002 study by researchers at Washington University School of Medicine in St. Louis exposed lab rats to huge amounts of rf radiation, for hours on end, yet found no significant evidence that the exposure caused increased incidents of cancer. But there could be other adverse effects. In 2003, Leif Salford of Lund University Hospital in Sweden scattered pulses of low-level microwave radiation across the brains of rats, and found that even a single two-hour exposure can kill some brain cells. Those results await confirmation by additional studies, and even Salford cautions that his results might not apply to real-world cell phone use. Still, the FDA and the Federal Communications Commission have taken preventive steps... just in case. For instance, there are limitations in place regarding how much rf energy cell phones are allowed to give off, and these amounts are much lower than the levels shown to cause damage in the aforementioned lab rats. Cell phone manufacturers are required to report the rf exposure of all their phone models to the FCC. For my part, I'll stick to being annoyed by WiFi interference problems, and ignoring the strange voices being emitted from my computer speakers. 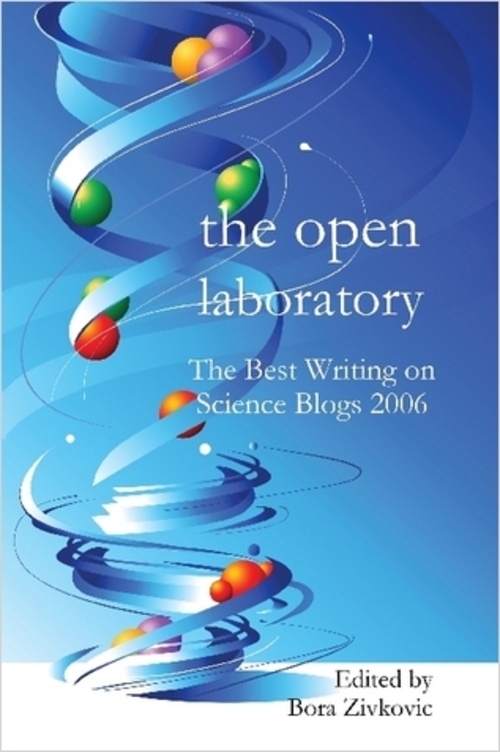 Among other things, they're telling me to buy The Open Laboratory, the first-ever anthology of the best posts from science blogs in 2006. The voices think you should buy a copy, too, especially since one of my own posts is among the entries. You can order them from Lulu.com, a print-on-demand service. (It's a format that is very a propos for the blogosphere, I think.) Kudos to Coturnix of A Blog Around the Clock, for pulling the project together in record time. The voices hope this marks the beginning of an annual tradition! If folks were truly concerned about the dangers of cell phones, then their use would be banned while driving. I've read cell phone use causes more accidents than drunk driving. I second JoAnne's statement. Just last week I saw a driver totally ignore the cop who was giving directions at an intersection while the lights were down because the driver was preoccupied with his cellphone conversation. The lack of consideration for others' safety is much more dangerous than any long-term effects from the electromagnetic fields used in mobile phones. I agree with the previous comment on driving and cell phones. I've been nearly hit several times by oblivious idiots chatting on their phones. The "Mythbusters" tested whether a cell phone could interfere with avionics. As I remember, their conclusion was that it was plausible. I suspect cell phones are more of a potential problem than GPS is that the transmitter is closer to the avionics and presents a stronger signal. I believe the GPS signal is also spread over a wider bandwidth. Another problem with mobile phones which might happen on aircraft is that if the phone can't get a response from the network, it electronically shouts louder and Louder and LOUDER until it does get a response. An aircraft full of phones none of which can hear any base stations would be a *very* noisy electromagnetic environment indeed, far more so than the piddling little signal from GPS. Another issue with phones on planes is with how they'd interact with the base stations on the ground. They're designed so that you'll never "see" more than a tiny number at once, and not change cells particularly fast. If you're on a plane travelling at umpty hundred miles an hour at tens of thousands of feet, then if you do get a signal you'll get it from a *lot* of cells, and cells will move in and out of range very fast. The network doesn't like that at all. And finally, remember that take-off and landing are the most dangerous parts of a flight. That's why you're asked to turn off games and computers - when you turn them off you generally put them away, so in a crash they won't go flying around the passenger cabin and injure people. Of course, the airlines don't like to tell people the real reason so spin a tale about interference. Cellphones seem to always talk to speakers, computer or otherwise, as far as I've found. It seems to occur when the phone is first turned on, and when there's about to be an incoming call. I think it's when the phone is exchanging a 'handshake' with the nearest cell tower, acknowledging the phone's existence or seeking it out to relay a call. The system doesn't even have to be powered on, as I've intercepted the 'dup de dup de dup' buzzing pattern on a stereo that's turned off (though plugged in). The "no cell phones on airplanes" rule wasn't (just) about interference in the spectrum. There are also FCC regulations in place because the use of cell phones that far up could confound cell towers and interfere with ground based communication (or at least they could when the rule went into place in 1999). The other, non-scientific, explanation is that business traveler values the peace and quiet of three blissful hours away from their cell phone (and don't really want to listen to 50 other passengers screaming over each other into their own phones). There was a nice (and humorous) article in The Economist a while back (Fear of flying, Sept 7th, 2006 (sub req.)) about lies during the safety instructions. Also, the annoying signal from the mobile phone comes from the phone switching on and off with a ~217 Hz frequency for bandwidth sharing. This bandwith sharing causes a lot of noise in the audiable frequencies that can be picked up by the loudspeakers. When it comes to interference phenomena, a Swedish blogger recently complained in a post that switching of his ceiling lamp changed the channel on his TV. I once put a compact fluorescent into the ceiling fixture in my living room. It continuously simulated the "Volume Up" function of the infrared remote for my stereo. I removed the compact fluorescent from the ceiling fixture in my living room. Of course you'll be hampered by the limits of your mobile phone - and there is always the risk that a savvy terrorist could alter his mobile to interfere with flight control (especially during take off or landing) - oh no, I shouldn't have said that, they are sure to ban mobile phones in the air (again). But the Ryan Air boss is a pretty cavallier chap, no fear of mobile phone terrorism on Ryan Air flights, more likely to get - having to queue for a pee - air-rage. And I agree with JoAnne, car drivers on the ground holding a cell phone instead of the steering wheel pose a more serious threat - if you must talk to someone other than the person next to you, please use a no hands mobile phone in your car. Thank you! The National Telecommunication and Information Administration (NITA) has an excellent pdf document showing just how crowded the frequency spectrum really is. I keep a large poster of it in my high school physics classroom. Go to NITA at: http://www.ntia.doc.gov/osmhome/allochrt.html and click the "U.S. Frequency Allocation Chart as of October 2003 (Adobe Acrobat format)"
This poster explains why telecommunication companies are paying $billions for a slice of the UHF, SHF, and EHF pie. This will all get very interesting as NASA is predicting a VERY active solar cycle 24, due to peak in 2010/2011. We have a very "boring" sun right now as the 11-year sunspot cycle bottoms out in late '06/early '07, but as we ramp up in activity over the next 5 years, Mother Nature might be the one opening garage doors. All electronic devices leak - phones at frequencies above and below the transmission frequency - they are effectively computers with clock pulses and and data buses and carrier waves and lots of other stuff. Earlier phones, I can't recall whether digital or analog, have been shown to interfere with Autopilots and other navigational equipment. Among the reported symptoms were errors in altitude and heading, both pretty serious. Of course newer phones try to save power, so if they can find a base station, they don't use as much power and there is less risk. I do suspect that human engineering is going on as well. If you want humans to do some things, they won't do it if you give the real reason, but if you give plausible reasons which can have an impact on EVERYONE in the plane, most will go along. If we were serious about safety, we'd outlaw cars altogether. Americans have a one percent chance of death due to an automotive accident. I doubt that the driver with a cell phone is more dangerous than the drunk driver. But, there are many more cell phone drivers out there. The number of drunk drivers out there is likely under reported. Not all of them have accidents. The MIR space station is not likely to be transmitting any time soon. There's also another ominous form of sound waves afflicting parts of New York, which are being used to chase occupants out of their apartments so landlords can hike rents. It's a rather odd device - a test pattern generator/oscillator coupled with an operating system that works like audio radar that can track the movement of occupants through concrete walls and specifically target their ears with a stream of 9,000 MHz sound. Briefly, the intense sound waves are beamed through floors or ceilings by a series of small sensors strategically mounted on the wall, ceiling or floor. The stream works like motion detection equipment. Once the signal bounces off a moving object, it returns to the sensors. The PC then, gradually, via triangulation, gets a read on the location of the target and projects a steady stream of nearly invisble sound (you have to hear it to believe it!) that in turn follows the occupant throughout the apartment. The powerful stream, nearly inaudible unless it's directly aimed at the ear, can in due course cause deafness. The system apparently originated in North or South Korea by a firm called, Yoon, inc. If you're assaulted by such a device, vacate immediately. Personally, I'm far more concerned about the affects that all of these devices are having / will have on radio astronomy than I am with the minor inconvenience of one device talking to another (although they're caused by the same thing - normally crossover into a frequency they're not supposed to be in). See http://www.nrao.edu/whatisra/rfi.shtml and http://www.craf.eu/ for more info. The big difference is that while cell phones transmit RF, GPS devices are "listen only". The transmitters in a GPS net are all in satellites, so the power levels at the receiver end is really, really low. As a matter of fact, GPS power levels are actually below the noise floor of any practical receiver and require clever signal processing for the receiver to function. Cell phones, on the other hand, transmit tens of milliwatts when you're talking, and are obviously very close to the aircraft receivers. So interference is much more of a problem for cell phones. Even the older garage door remotes that use dip switches are relatively secure against random guessing as 2^8 is a very large number. "Tools for Healing" ... A long time ago a friend and I were thinking of selling "Radioactive Electron Filters" that you could plug into the wall socket. The idea was that it would filter out those "radioactive electrons" produced by nuclear power plants. I guess we just weren't in the same league as these other guys. "... the strange voices being emitted from my computer speakers ..." I'm waiting for the late-night talk shows to pick up on the "space aliens are taking over my computer" thread. Not only that, but "carbon dioxide is a dangerous substance" that will have be be regulated. Norris is better known among the industrial community as Elwood Norris - at least, that's what it says on his Lemelson-MIT Prize. His system (one of his many inventions) lets you send out an essentially coherent beam of sound, over long distances (a few hundred meters). One of the applications has been used to repel pirate boarders from a Navy ship. The system doesn't just send noise, it sends voice and music. The downside of the system is that "they" will be able to direct targeted commercials to individual people (or groups) is places like Times Square. And the voices will be coming from inside your ears, not a remote speaker. "Isn't the GPS a far greater interference risk, or am I missing some crucial point?" As Jim pointed out, GPS are receive-only, so they don't emit anything. However, some countries do ban them, on the assumption that anyone who wants to know where he is in the air must be planning on taking the plane to somewhere other than its scheduled destination. Thanks for the re-post! Like Quasar9 I use the poster of the U.S. Frequency Allocation chart when I teach high school physics. I also have my overhead fluorescent light occasionally turn on my TV/DVD player to DVD mode. I may point my students to this blog post when that topic comes around again this year. I came across this while working on my thesis in robotics. I have a wireless camera installed on the robot, than when being used interferes with the wireless network. Which was a pain since I couldn't look up anything on the internet, send emails, etc. while the robot and camera were in operation. Occasionally it also seemed to interfere with the bluetooth that I was using to communicate with the robot from the PC. Though fortunately this was infrequent, possibly due to the "hopping" bluetooth uses. On another note, you mention the web site How Stuff Works. The founder of How Stuff Works, Marshall Brain, was an undergraduate teacher of mine, many moons ago. He was fantastic in explaining things such as doubly linked lists and binary search in an early programming class. He is also giving a talk entitled "The accidental entrepreneur" at NCSU (www.csc.ncsu.edu), which I am planning on attending. Thanks for the great blog, keep it up! P.S. - I bought "Physics of the Buffyverse" for my fiance. So far she's enjoying it. If it happened at night in the Rockies ... the plane might hit a mountain ! Any Radio transmitter leaks other frequencies and lots of receivers use Phased Locked loops which means the receiver generates some of the frequency that it is trying to receive and actually leaks other frequencies too ! This is how Radar Detector Detectors work ... by detecting the leakage from the PLL in the receiver. I certainly have to agree with the Quietness reason on planes - I DO NOT want to listen to any business man's whinges for a constant three hours on a plane ! I wish phones were totally banned while driving - my kids would rather I make it home on my motorcycle or bicycle than have someone wipe me out while discussing what colour shoes they're going to wear tonight ! If it's important enough to answer, it's important enough to pull over !